Joseph Brodsky, Watermark: An Essay on Venice. Penguin Classics, 2013. First published 1992. Javier Marías, Venice: An Interior. Translated by Margaret Jull Costa. Penguin Books, 2016 [and part of the essay collection Between Eternities, 2017]. First published in Spanish, 1988. 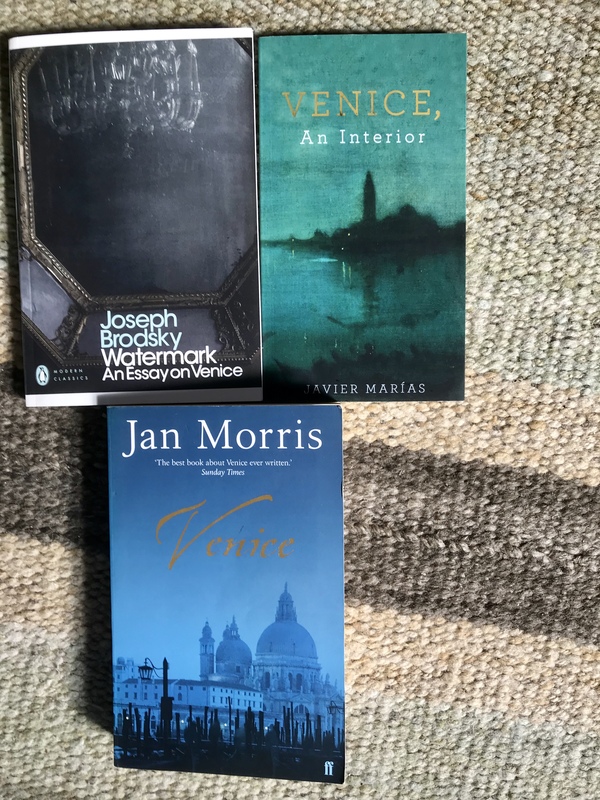 My previous two posts on Venice have touched on recommended Venice-based or –set reading; the Brodsky I read after my return from the recent visit with Mrs TD to celebrate her birthday – our first time in the city – and was inspired by this post by Karen at Kaggsysbookish Ramblings. She provides an excellent introduction and background to the Russian poet, and a perceptive review – so there’s not much more for me to add about his book here. As she says, it’s a prose poem/meditation. I too found the strange visit to Ezra Pound’s former mistress, Olga Rudge (with Susan Sontag, of all people) a stand-out scene. There’s a beautiful anecdote about her first meeting with Stravinsky, at a violin recital she was giving (she was an outstanding concert violinist, which is how Pound first encountered her. She survived him by several decades and was buried beside him at San Michele). …the main error was an old one: questing after beauty. For someone with such a long record of residence in Italy, it was odd that he hadn’t realized that beauty can’t be targeted, that it is always a by-product of other, often very ordinary pursuits. He listens to Sontag trying unsuccessfully to deflect Rudge from her lengthy whitewash job on her fascist-sympathising, anti-Semitic lover; having dealt with countless ‘old CP members’ it was a tune that rang a bell. They left the house and found themselves, significantly, on the Fondamenata degli Incurabili. Brodsky’s love for the city and its ‘serene beauty’ is rapturously told – ‘this city is the eye’s beloved’ – though he’s not blind to its occasional decaying squalor, its decadence and artificiality and superficiality. I wasn’t so keen on the objectification of women, including his unreconstructed lusting over the beautiful (married) Veneziana who met him at the station on his first visit and introduced him to her city. Among several enigmatic images (others include his repeated, interwoven references to chordates and fish-eye perception; tears, surfaces, reflections/water, beauty and time – and a woman with mustard-and-honey coloured eyes) is a strange description of the ‘wonderful’ Bellini tempera portrait of the Virgin and Child that was in the Madonna dell’Orto church in Cannaregio sestiere near the Ghetto (he couldn’t have mentioned its theft in 1993, after he was writing this essay). 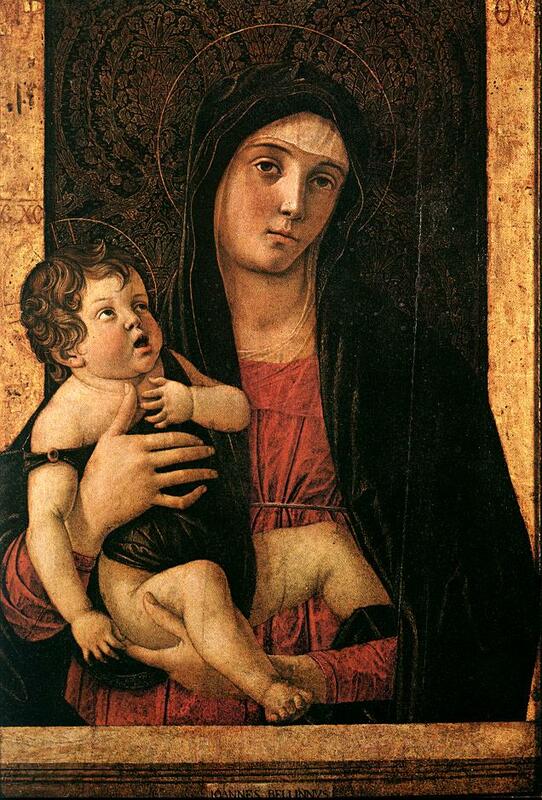 the inch-wide interval that separates [Mary’s] left palm from the Child’s sole. That inch –ah, much less! – is what separates love from eroticism. When I look at the image I think it’s this description that makes more sense. In fact the Marías essay is in some ways the most interesting of the three texts discussed here and elsewhere (though it’s probably apparent from some of my earliest posts at TDays that he’s one of my favourite authors: list at the end). Morris is more of a comprehensive guidebook, but his is the most vivid. He can be as poetic as Brodsky in his palpable love for the city – he visited it fourteen times between 1984-89 – but without the sometimes mannered obscurity. His description of night-time, when the inky darkness accentuates the city’s ‘stage-set’ dramatic quality, is beautifully evocative. He also identifies in a few succinct, vivid images the essence and soul of this compact city (in theory one could walk from end to end in just over an hour; in practice this is impossible because of the dead ends and distractions). There’s what he identifies as its harmony and homogeneity, its seediness and ostentatious glamour, and, paradoxically, its fragmentation and articulation. Singers at the theatre sometimes complain that their voices cannot be heard above the rattle of jewellery and that their eyes are dazzled by the glint of gold in the darkness, because some ladies do rather over-adorn hands, ears and neck in their eagerness to outshine, well, themselves, principally. At the beach on the Lido they’re dripping in jewels (even when they go for a swim) and dressed to the nines. He gives an entertaining account of the love-hate relationship between the Venetians and the hordes of tourists. Each sestiere or district (there are six, as the name suggests) has its own distinct atmosphere and ‘idea’. Locals from one area are unlikely to venture beyond the end of their nearest canal, rarely straying into the tourist honeypots – and they’re snootily dismissive of any place else. The same thing or person seen in one sestiere appears different in another (he gives the example of a beggar who moves about the city, shifting shapes mysteriously). I find these perceptions more human than Brodsky’s rather cerebral musings. Marías identifies the strange ways that distances between places on the island can’t be measured by space alone. That account of the Bellini was to demonstrate that even though it’s found just a stone’s throw from the Grand Canal, it seems ‘a thousand leagues away’. Both he and Brodsky are dismissive of Visconti’s film Death in Venice. Both are good on the best perspective from which to admire the architecture: from the water. But they agree that only the tourists can afford the gondola. When my wife and I were there it was 80 euros for a half-hour ride. We adopted the practice of the locals: take a gondola traghetto across the Grand Canal for two euros. It only takes minutes but is a much better deal. Otherwise the vaporetto (with a tourist pass) is good value, but often crowded. We probably only really lose what we forget or reject, what we prefer to erase and no longer wish to carry with us, what is no longer part of the life we tell ourselves. Readers of his fiction will recognise that haunting allusiveness to the elasticity of time and experience, universalised. Next time, as I’ve gone on too long here, I’ll return to the Jan Morris.